Monday morning was tough, I went to bed without earplugs so I could hear my alarm so sleep wasn’t so easy this time. Still, I was excited to get moving on the KTX to Busan. I got to the station well early to make sure I knew what was what, turns out all I had to do was step on the train when it arrived. So I got on it like 45 minutes before it was due to depart, and the carriage was empty up until about 15 minutes before the journey began, when everyone else seemed to pile on at once. Okay, so I didn’t get the window seat but I could still see out the window so fair enough I thought, until the other passengers pulled the screen down most of the way to keep the sun out of their eyes. So here’s me leaning over trying to see under the screen to look outside, not the best way to spend a 2.5 hour trip. What I did see was pretty amazing though, some of the terrain that we went through was astonishing, lush green mountains and stretches of farm land, occasionally interrupted by immense stretches of elevated railways. The transport infrastructure in this country continues to amaze me. So despite what I didn’t see, it was a cool trip. The display in the aisle showed the current speed of the train, you could watch it creeping up and up. The highest I saw it was 306km/h (190mph) which blows my mind. SLUNCH. BOBBY BOX. Both of these names crack me up. Er, am I on the right train? I got to Busan Station more or less bang on time, I met up with Ye-Seul and we got some lunch before heading off to find my hostel. I explained the directions to her and she couldn’t believe we’d have to cross the railway to get there, this isn’t the Busan she knows! We found it easy enough (managing to avoid being flattened by the KTX on the way), the building is a block of apartments, 36 floors so it’s pretty big (by my teuchter standards). The hostel is basically a converted apartment, three dorms and a living room/kitchen area. My dorm has an en suite bathroom and here’s the best bit, this is my fifth day here and I’ve been the only punter in the dorm. In fact, I’ve only seen two other people staying here, as well as the hostel owner Yoon who spends a fair bit of time in the place. He’s a really friendly guy, very helpful, cooked me dumplings this morning and we had a laugh at North Korea’s stance on Scottish Independence. Anyways, the view from the hostel is pretty pimpin’, being on the 8th floor. Only problem is that it’s right next to the railway so there’s the constant sound of the barriers at the crossing warning punters not to cross, as well as the trundling of trains passing – and in this city, the trains do not stop for the night. If I didn’t have earplugs I’d probably go mental. 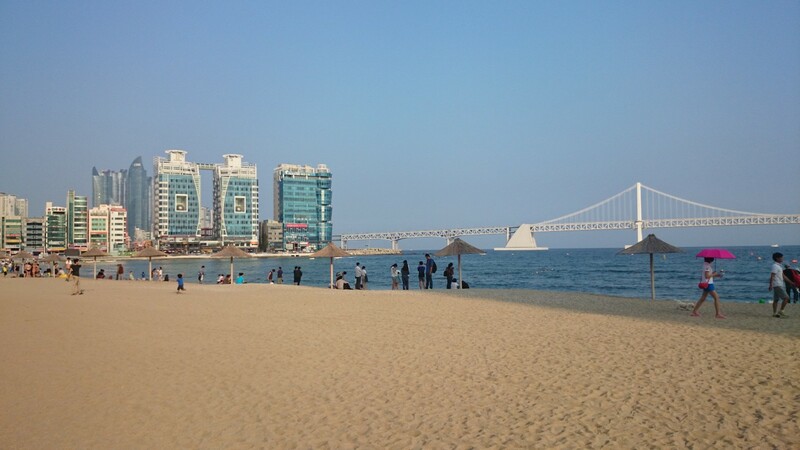 Ye-Seul and I left the hostel to go and have a look at Gwangalli Beach. I’d seen on the maps that there is a bridge over the sea in Busan, but didn’t know we were going to look at it. It’s a pretty spectacular sight. We wandered along the beach as the sun went down and the moon came up and the bridge was set alight by thousands of LEDs. Being on the beach gives Busan a very different vibe to Seoul, and it’s a vibe that has me fallen in love with this city. It’s still a big city, although not half as big as Seoul, but seems to be just as alive, with more than enough to keep you interested. We went and got some food and then went our separate ways for the night.